Good news everyone! 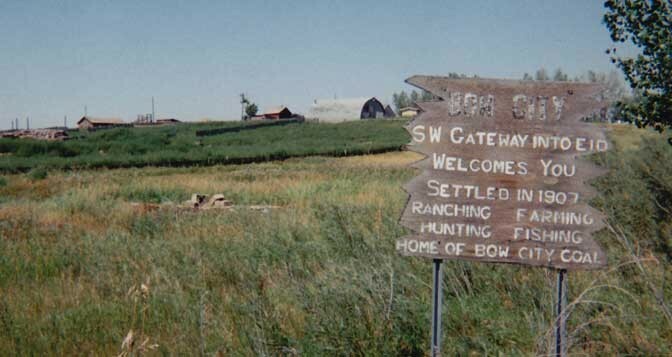 From the Brooks Bulletin, intrepid scribe Rob Brown informs the masses that the Province of Alberta has approved Vulcan County’s application for a historical marker at the site of the former Village of Bow City (reproduced below). A big thank you is owed to Liza Dawber and Vulcan County for their work approving and submitting the Heritage Marker application, and the community partners who supported the application. Just in time for next week’s 100th anniversary of becoming a village, Bow City has been awarded a historical marker noting the fact. On July 13, 1914 Bow City was incorporated as a village. Last week, Jonathan Koch, an avid historian working on the recognition project, said the province notified him a marker is forthcoming. He says it is important to recognize the past. “We certainly do run the risk of losing our history if these aren’t marked and people aren’t doing the work,” he says. On March 14, I was privileged to join a diverse lineup of presenters at Medicine Hat’s Esplanade Heritage and Cultural Centre for the second Pecha Kucha Night of 2014. It was an interesting and informative night for all involved, and I’d like to thank Pecha Kucha organizers for inviting me to present. For those who missed it, or who are looking to kill roughly seven minutes, I’m happy to present the Story of Forgotten Alberta.